I'm giving you ten random numbers that I believe you will find interesting about the Bulldogs of Georgia. The number 40: The Georgia Bulldogs were the only Division 1-A school to rank in the top 40 in all five special teams categories last season (net punting, punt returns, kickoff returns, punt return defense, and kickoff return defense). The number 14: The number of starters the Bulldogs have returning this year (7 on offense, 7 on defense). The number 1: The Dawgs have arguably the toughest schedule in Division 1 major college football. 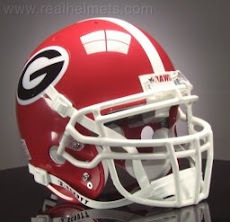 The number 1 also represents, in the minds of some, Georgia's position at the end of the 2008 season. 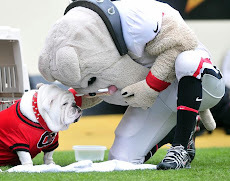 The number 2: Speaking of final rankings, some analysts predict UGA will only be 2nd in the SEC East. 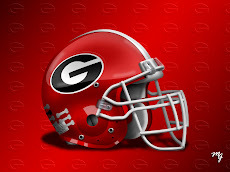 That number also represents the number of SEC titles the Dawgs have won under Mark Richt. The number 4: Georgia has four consecutive tough conference games away from Sanford Stadium late in the season ( LSU, Florida, Kentucky, Auburn). The number 9: Incoming freshman receiver A.J. Green was the nation's 9th overall prospect in the 2008 recruiting class. The number 3: The number of SEC players to rush for more yards as freshmen than Knowshon Moreno (Herschel Walker, Emmitt Smith, and Jamal Lewis). The number 6: The number of times Georgia scored 40 or more points in a game in 2007. The number 42: The number of SEC leading sacks the Dawgs defense recorded last year. The number 7: The number of opponents on Georgia's schedule who are ranked 29th or better in this year's preseason polls. I think these numbers basically say that the Bulldogs have a tough road to navigate this season, but they also say Georgia has the personnel and experience to make that journey a successful one. We will all find out...one week at a time beginning August 30th!